BBC 22478. 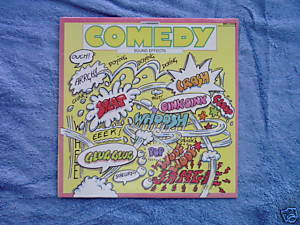 Sound Effects Comedy 1983 LP. BBC produced a series of sound effect recordings for use by amatures. This is by far the funniest. Tracks include laughter, bird noises, impacts (door breaking dwon, burstiing beer bottles), and a dragged piano. Many have been used on BBC productions Fawlty Towers, Not the Nine O'Clock News. Sealed LP with price sticker on reverse; cover is excellent.